For your child’s language, memory, concentration and learning development I highly recommend the Babytalk program as written in the book. ‘Baby Talk’ Dr Sally Ward. It only takes ½ per day and is invaluable, and really in a day when you are probably up and about for 16 hrs or so it is a small investment of time for great results. It covers 0 – 5 yrs and you only have to read the relevant age group. Baby Signs is one of the best things you can do for your baby. It shows that babies understand language and can use signs to tell their parents what they need, feel and think. Long before they can speak. All babies learn to wave a hand for bye-bye, shake their heads back and forth for no, and nod them up and down for yes. These gestures are examples of baby signs – simple easy to remember signs that babies can use to talk about things in their world that they don’t have words for yet. Teaching your child baby signs is an expansion of this natural language. Boosts your baby’s self esteem and self-confidence. What signs do you teach? There are over 100 signs in the book, their recommendation is to start with simple, everyday signs and expand as you want to. The first three recommended signs are eat, drink, and more, followed by hat, book, nappy. All the in and outs and signs are drawn and described the “Baby Signs – How to talk with your baby before your baby can talk” book. 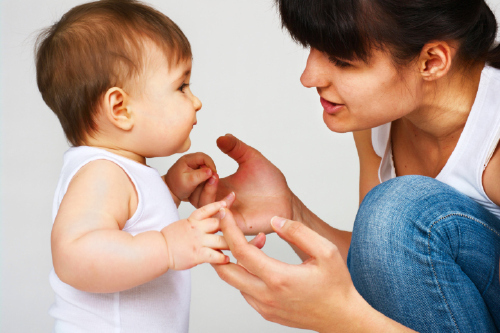 You do not learn formal sign language, these are just natural gestures and actions that you already use with your baby. The basic recommendation is that around 6 months is a good time to start and you will notice your baby using signs between 10 – 14 mths old. allowing your baby / child to play in a way of their own choosing rather than being directed by you all the time. The avoidance of correcting your baby, i.e. No, Not ruck, its truck. Instead just repeat ‘truck’ for them to hear. Avoid testing your baby i.e. “where’s Mummy?” “what’s that?” – you don’t ask questions that you know the answer to, the same applies to testing your child in front of an audience to show how smart they are as this provides unnecessary pressure to perform and in fact will make them less likely to offer information, talk etc. They then avoid it. No tv viewing for the first year or keep to very minimum. For more tips and advice, purchase "Babytalk" by Dr. Sally Ward from all good book retailers.